Imagine the bird in any color and the sentiment as Happy Birthday, Thinking of You, Get Well, With Sympathy, etc.... Change the ribbon to coordinate with the bird color. One template = a jillion ways to use it beyond the holidays. Also, with this card being so simple, you can make a bunch and stash them away for future use. 1. Fold the Very Vanilla CS in half. 2. Stamp the branch onto the middle of the 4” x 5-1/4” piece of Very Vanilla CS with Early Espresso ink. 3. 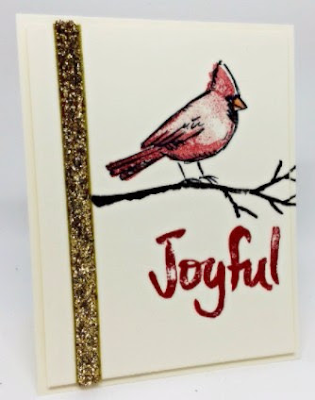 Stamp “Joyful” in Real Red ink directly below the branch. 4. Stamp the outline of the bird onto the branch in Basic Black ink. 5. Ink up the bird body with Real Red ink, stamp off onto scrap paper, then stamp onto card. 6. Adhere a strip of Gold Glitter Ribbon along the left side of the card, securing the ends with adhesive. 7. Adhere the stamped panel to the card base with dimensionals. Remember, you do not have to be creative to create - just copy this project! 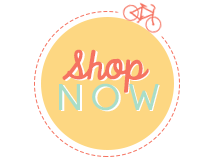 Order any of these supplies by linking to my ONLINE STORE. Check out this week's Weekly Deals HERE!